This week has been quite harrowing: my sweet little Callie had four seizures on Sunday and was admitted to the hospital for three days while doctors tried to figure out what was going on. The good news is that she appears to be in really good health, especially given her age and puppy mill past, except of course for the seizures (“Other than that, Mrs. Lincoln, how was the play?”). The veterinary neurologist (#firstworldproblems) has diagnosed her with idiopathic epilepsy encephalitis, which I think means they have no idea what’s wrong but have to say something because I’ve essentially just donated a new wing to the hospital. She’s now on two anti-convulsant medications a boatload of medications and home, staggering around like a drunken sailor and twitchy. It takes a little time for the meds to kick in (or to get the right dosage), but I am very hopeful that these partial seizures will stop soon. UPDATE: She has been re-diagnosed with encephalitis (GME—autoimmune encephalitis). This makes me very sad, but it is treatable with a LOT of meds (including injections which I get to learn how to give) and very careful management. Luckily the neurologist I have is one of the best in the world at treating this, so I remain hopeful. I do know for sure that both Gilda and I are very very happy to have her back with us, bobbling head and all. 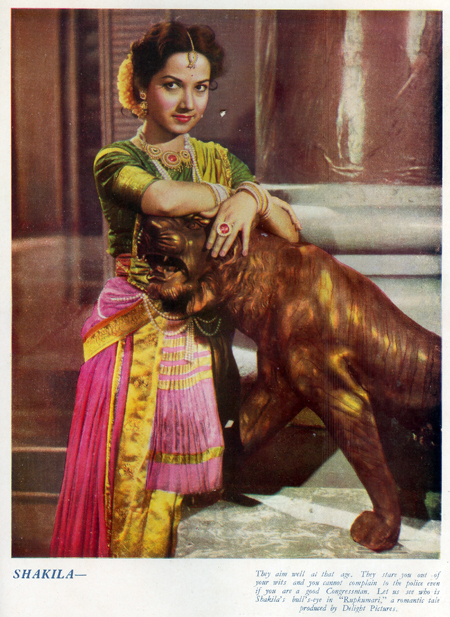 But I have not had the time nor the inclination to watch any films so you’ll just have to make do with more gorgeous Filmindia scans. I know, I know: they are no kind of substitute for my deeply analytic and scholarly reviews, but there you have it! Try to manage. First up, another film poster cover. Yum yum yum. Those women, who have ideas and can draw them on paper and in doing so tell their neighbours how to dress and look smart, can send their ideas and sketches to us and get paid for them. We invite sketches and articles on everything that women do, undo or should do, or wear, don’t wear or should wear. And we pay well for these. And we can, if necessary, keep the name a family secret. These are likely some of the results (click to enlarge the pictures so you don’t miss a single pearl of wisdom). 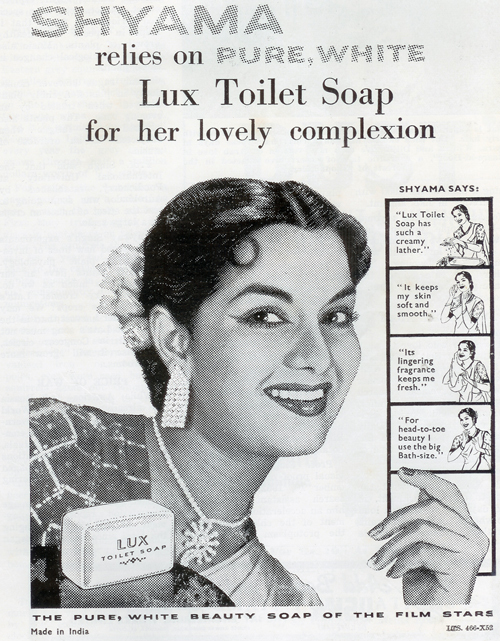 Then there are the ever-popular Lux Toilet Soap ads. Be sure to use the big Bath-size! And of course, my favorites: these luscious hand-colored photos. Posted on February 16, 2012 at 1:29 pm in Baburao Patel's Poisonous Pen, Hindi film history, Hindi movies, The Memdogs	| RSS feed You can skip to the end and leave a reply. Wishing her a quick and complete recovery. Those sketches are great. What an artist she must have been. 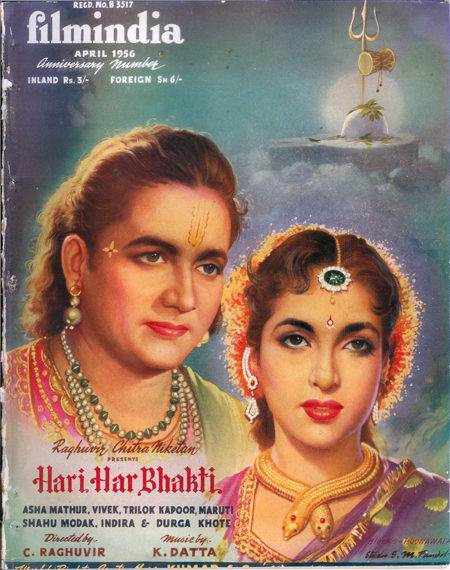 Trilok Kapoor was a handsome Kapoor, seems to have appeared mainly in mythologicals. It seems like the surname Kapoor=handsome pretty much across the board! Thanks for your Callie wishes, I am doing the best I can. She is such a sweetheart and really deserves to have some happy years ahead still. Wishing Callie (and you!) a speedy recovery! 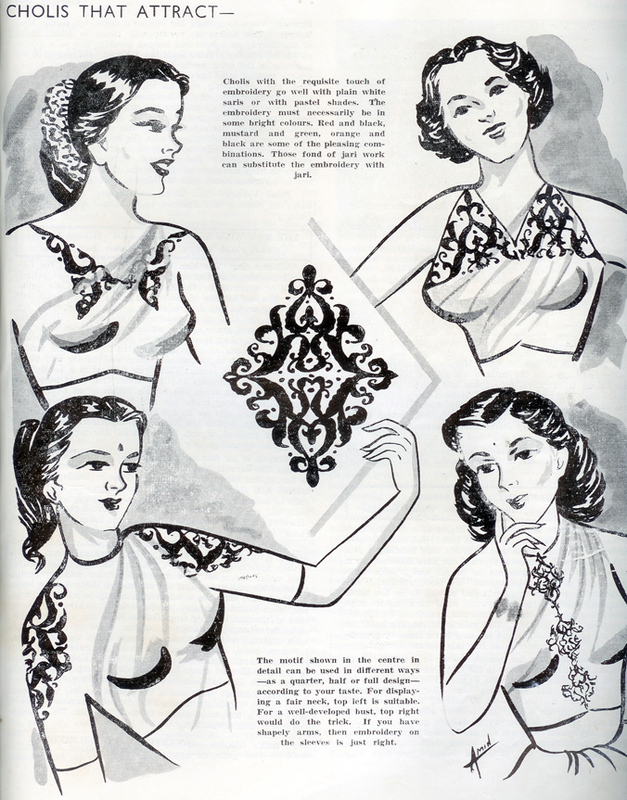 My mother must have been following FilmIndia in those days – I distinctly remember two of her blouses having the necklines worn by the two ladies standing on the right, in the picture on the left! 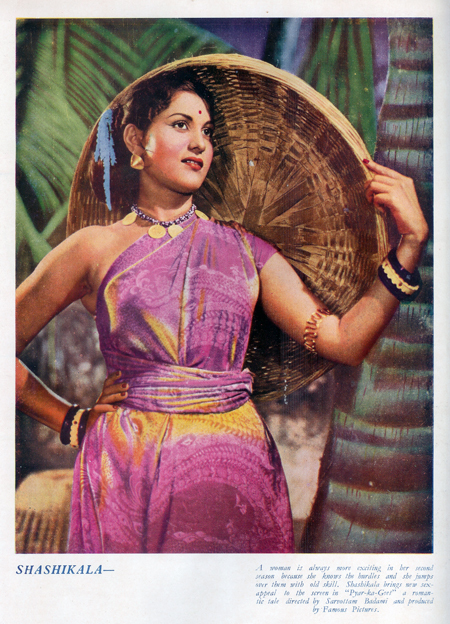 My Dad used to bring FilmIndia, which later became MotherIndia, from work – they had a circulating magazine library at his work – and I remember looking out for the fun stuff in them! Wishing Callie a speedy recovery. Memsaab, please post pictures of Shahu Modak ji if you find them in your old magazines. Hope Callie gets well soon. Love. Sorry to hear about Callie doing poorly. Wishing her a speedy recovery. I am surprised very little of Dilip Kumar, Raj Kapoor and Dev Anand is seen in Film India. They were ruling the roost in 1956. Or is it that those pages are missing in this post? Wishing Callie a full recovery. She is fortunate to have your love and care. Sorry to hear about Callie. Hope she gets well soon. ‘keep the name a family secret’ hmmm I am afraid I have brought shame upon myself by publishing my name all over the place. >am afraid I have brought shame upon myself by publishing my name all over the place. Luckily I have more Filmindia candy to share, once I get it scanned! Speedy recovery to Callie. I hope that the doctors get the right medicine for her soon. Wish her that she be her old self again soon! the covers are simply works of art! 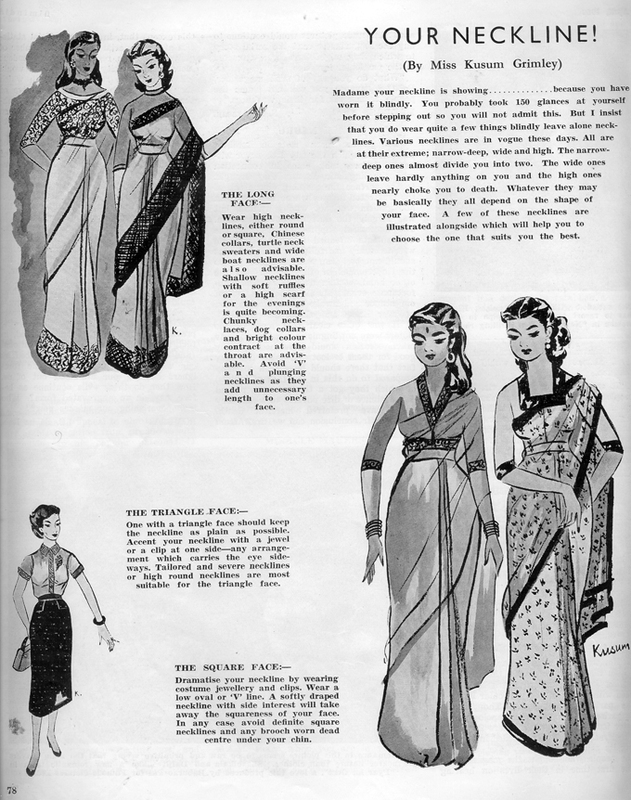 @Memsaab – The pictures and the ads are lovely. Makes us hungry for more. There are dogs who have no humans to care for them. Callie is lucky to have you. I am sure all the regulars of this blog who are also pet lovers pray for Callie’s speedy recovery. Pets are family and it pains us when they are unwell. Bhhole, our senior dog had developed a sore foot recently and my wife was anxious about him. She naturally suspected our daughter to be behind it, but later came to the conclusion that it could be a result of inter dog rivalry between the two dogs. She applied a pain balm on Bhholey’s paw and dressed it. Bhhole tried to take off the dressing, but then he let it remain there, when he felt relief. By now he has recovered, much to our relief, otherwise my wife was worried about Bhhole’s leg. I am glad he is better :) Callie has a long (and expensive) road ahead, but she is my sweet companion and she deserves whatever I can do for her. The worst thing is that they cannot tell us how they are feeling, where they are hurting exactly … Internet and vets are our best bet (besides prayer :)). I loved reading James Herriot’s books on his experiences as a vet. @Memsaab, wonderful rare stuff. A request, before putting up any scans on blog, can you please put your blog signature on it ? After all this is your hard work and you should be given credit if this material reproduced any where else. If I did that Yakuza, it would make me a hypocrite! One of the saddest things about Indian film history for me is the apparent need for people with rare (and even not-so-rare) material to deface and splash huge ugly logos over everything. 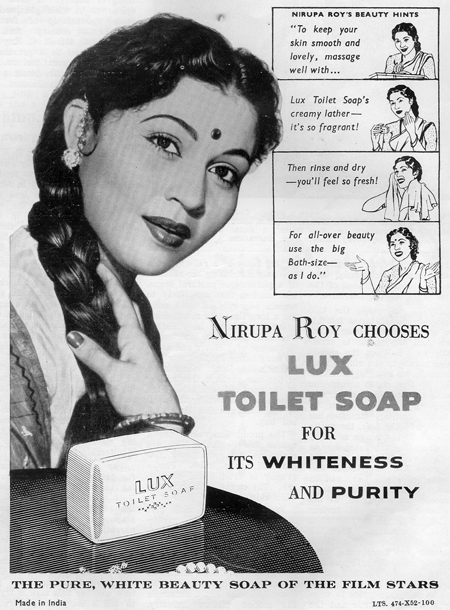 Hindi film history is not mine to “pee on” as it were; I don’t feel the need to mark things that I had no hand in making as my own. I only wish more people felt the same; these beautiful movies and archival materials are in bad enough shape as it is. Memsaab, I just stumbled upon your writings while looking for the name of a particular 70’s Bollywood movie. I went through some of your pieces- you really do know quite a lot about Helen movies! Could you tell me which movie soundtrack this song samples? http://www.youtube.com/watch?v=wwTa0AMhEr0 I can’t for the life of me remember! This was also sampled in “Main aisa kyun hoon” from Lakshya. I can’t put my finger on it either, although I hear some Bond in there! Memsaab, I wish your puppy gets well soon. I have to say that find your pictures of Shakil and Shashikala most delightful, especially the extremely small-print explanatory text at the bottom right of the frame! Thanks Prasad :) And yes, Baburao’s commentary is always delightful, especially if you aren’t the object of it! Dear Memsaab, This is to send lots of love to Callie. I know another dog with epilepsy. Its hard but very manageable with drugs.Wishing her a speedy recovery. Thanks Shohini :) She doesn’t have epilepsy as it turns out, but something worse (GME—encephalitis). But I’m going to take the best care of her I can! She’s already looking better. And I am sure that the thoughts of everyone across the planet is helping her! Dear Memsaab, I am sorry to hear about GME. I will certainly try and educate myself about it with the help of the vets I work with. With so much care from you and love from an international fan club, Callie will certainly do very well. MUch Love.